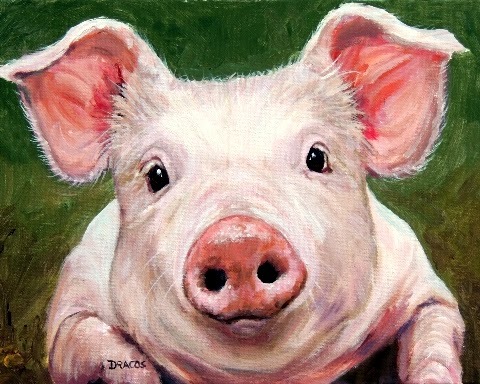 Several months ago I did another pig painting and found it so challenging that I decided to do another one (and I have some more planned, too). This little sweetie is on a green background. The original painting (available at the time of this post) is an 11x14x3/4" acrylic painting on stretched canvas, wired and ready to hang). How any human being could eat one of these beautiful, intelligent animals is beyond me - but that's another post! 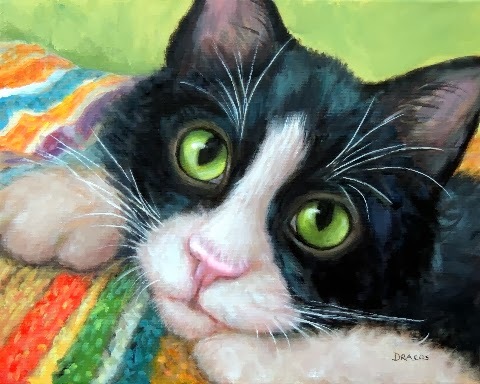 I am currently still finishing up the custom cat painting, which I expect will be done in just a couple more days. Then I'm going to be doing a landscape painting, I think, one I've been planning to do for a long time - of a countryside scene in France, a late-afternoon scene with amazing colors in it! It's a just-for-fun painting -- well, they'll all just for fun, but some are more so than others! I'm still doing my ceramic pieces but at a slower pace than I was before. I still like to do them, but I've been missing painting as much as I like to, so I've gone back to concentrating more efforts on the paintings. I'll probably change again, though. I always do. I just finished this sweetie today, and I love it. 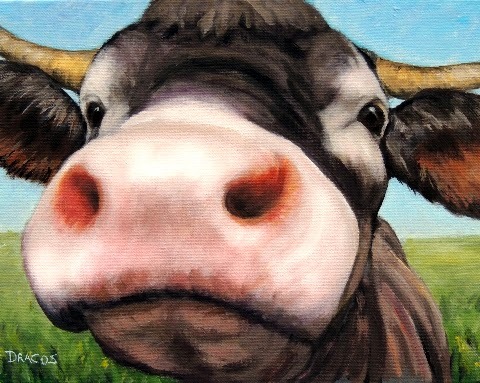 It's a fun painting to me, and I think his/her eyes are so sweet looking. I have both the original and prints listed online if you're interested in having this sweetie hanging on your wall. The original is acrylic painted on an 11x14x3/4" stretched canvas, no staples on the sides, and it already has a hanging wire on the back so can be hung up just as soon as you receive it. My next painting is a custom I've been working on for a few days. It's another cat and a beautiful one, too. I'm really enjoying doing the painting. Now I've got two more commissioned paintings coming up, so I'll be working on them for the next month. Still trying to keep my commissions at no more than two per month so I have time to enjoy life. And spring is coming!!! I can feel it! Here in Oregon, it's v-e-r-y slow in arriving, but there are signs: trees starting to bloom, bulb flowers in full bloom, a few days of real sunshine every so often, people out and about more and more, my thoughts turning to travel again (although, unless things change, my France trip isn't happening until September -- and as I think I've mentioned before, its length keeps getting shorter and shorter due to a certain little one who is too young just yet to go with me without both of us being miserable), just all kinds of signs that spring is, well, springing!! I must close with: An early springtime many years ago, my aunt was leaving her job at a neat old hotel (now destroyed, I'm sad to say) in Pensacola, Florida, called Hotel San Carlos. She was standing at a street corner when an obviously a-bit-inebriated man approached her with a big smile. She was a bit nervous, but then he said that he wanted to recite a poem for her. Here it is: "Spring is sprung, grass is riz, I wonder where them flowers is." That's it! We have enjoyed reciting it every springtime since then -- along with e. e. cummings "In Just Spring," of course!!! One of my favorites! Here it is if, one, you're not familiar with it or, two, you just want to have a warm, fuzzy remembrance: http://www.poetryfoundation.org/poem/176657. 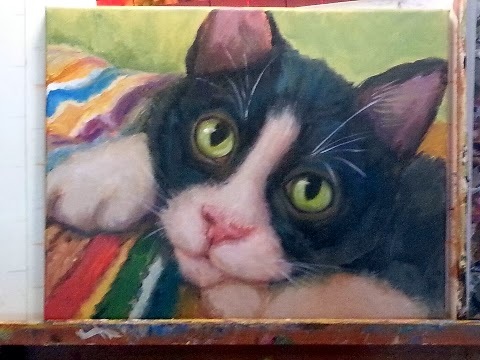 Sorry about the quality of the photo, but I think you can get an idea of what the painting is about: She's a pretty little tuxedo kitten that I'm doing a custom painting of. Her name is Bea, and she's lying on her favorite blanket. I'll be finishing it today, so I'll post a photo of the finished painting later on today or tomorrow. Okay, off to work now. Just wanted to show her off because I think black-and-white ("tuxedo") cats are so adorable, and she's a particularly pretty one. I've been away a while because I've been awfully sick with a really, really bad cold. It's almost conquered now!! I'm such a wimp sometimes!